The Grand Junction Fire Department responded to a potential HAZMAT (Hazardous Material) incident around 11:15 this morning. 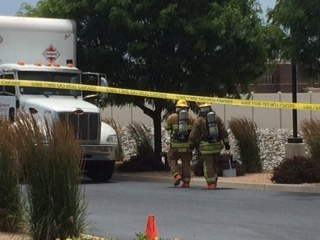 Initial dispatch reports confirmed that one person was exposed to an unknown substance in the storage compartment of an environmental services company truck that just happened to be parked in the Colorado Bureau of Investigations parking lot. This person was immediately transported to a local hospital for evaluation and treatment. 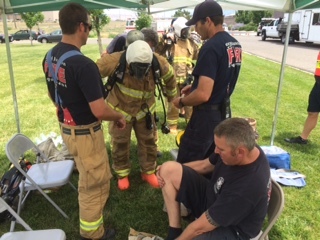 The Grand Junction Fire Department’s HAZMAT Team was dispatch to the location to help identify and mitigate any potential threat. Incident Command was established and a perimeter of approximately 150′ around the truck limited access in and around the vehicle to HAZMAT personnel only. Incident Command also made contact with the Colorado Bureau of Investigations to inform them of the incident in their parking lot and to ensure an open line of communications during this incident. 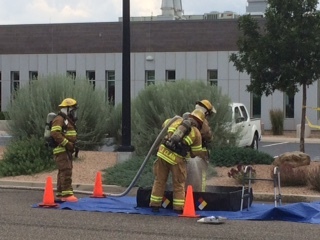 “The CBI is working closely with the Grand Junction Fire Department’s HAZMAT team in response to this issue. The emergency responders have the CBI’s full cooperation as they work to mitigate this incident” – CBI Director Ron Sloan. 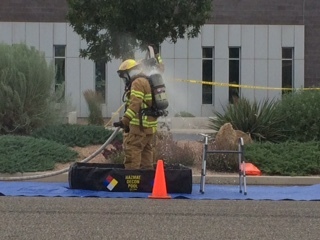 Once the HAZMAT Team arrived, the technicians donned their protective gear and made entry into the secured scene to evaluate the substance and its potential threat. The substance was identified as both flammable and corrosive. GJFD HAZMAT Technicians placed the compromised container into a HAZMAT specific “Over Pack Drum” that secured the toxic material. The technicians then proceeded to the Decontamination Station that was setup for them to eliminate any potential contaminates on their gear, a process known as “Gross Decon”. At no time was there a threat to the public during this incident as the hazard was isolated and contained within the truck it was initially transported in. Only the driver of the environmental services truck was exposed to the substance and their current heath status is protected under HIPPA (Health Insurance Portability and Accountability Act) and will not be released by the Grand Junction Fire Department. There were no other injuries to the public or HAZMAT technicians on this incident. Incident Command has turned the scene over to Veolia North America who will handle the clean-up, decontamination, and disposal of the secured substance.